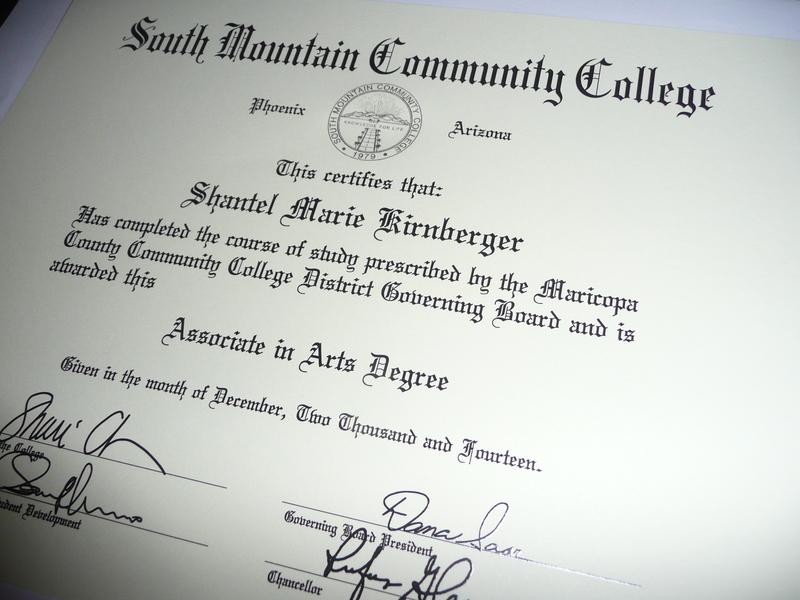 It took a lot of hard work, and a bit of extra time, but I am so happy to share that our daughter, Shantel, received her two Associate Degrees from South Mountain Community College today. 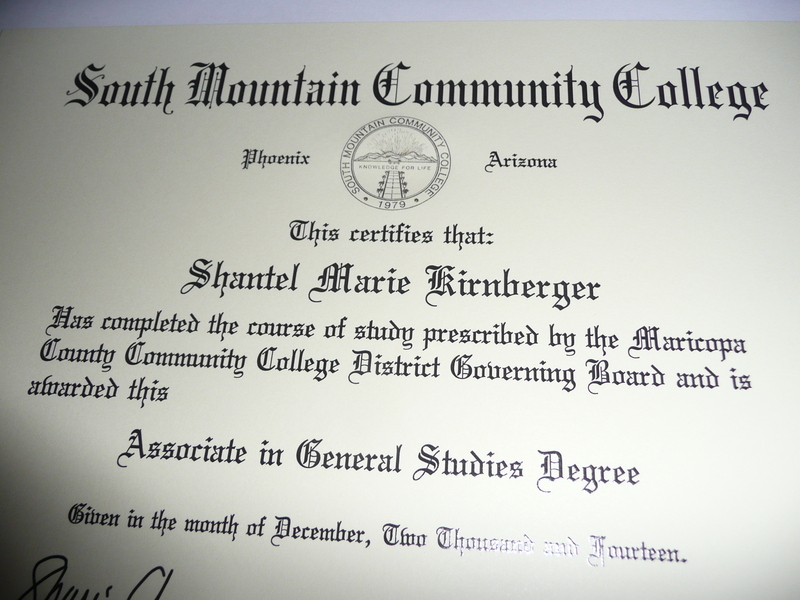 Shantel, Papa and I are so very proud of you, and the hard work and effort you put forth to earn these two degrees. We know accomplishing this goal was the first step in following your dreams, and we hope you will go on to continue your education as you can, and that all your dreams come true… We love you to the moon and back and so much MORE!!! I went to visit my mother today at the Care Center where she lives and found her sitting in her wheel chair in the activity room, playing bingo, with a volunteer sitting beside her helping her search for the numbers on her bingo card as they were being called out. 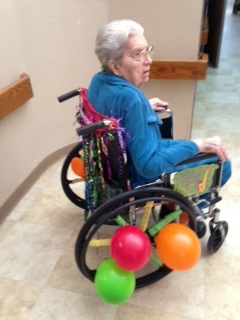 I went up to my mother and hugged her hello, and noticed her wheelchair was all decorated up for Mardi Gras, with balloons, streamers, beads etc. 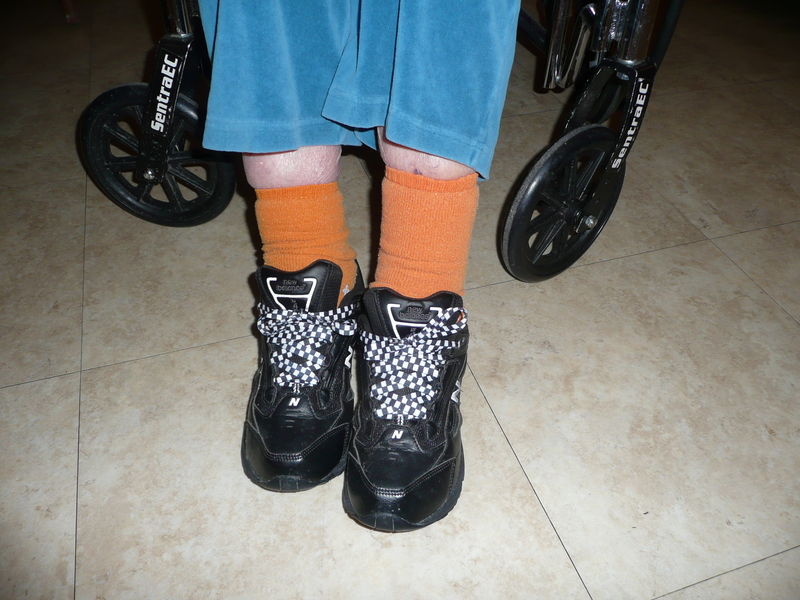 As I looked around the room, I noticed that most of the residents wheelchairs were decorated in much the same manner. The more my mother told me about how she is scared about everything, and that she doesn’t want to be around Donald anymore, and that she really just doesn’t want to “do any of this any more…” I decided I needed to speak to her nurse and see if mom could be given something to help calm her nerves. When I took my mother to the dinning room for lunch, I got her settled in and told her I would be right back. I went to find her nurse and it just happened that mom’s doctor was there as well. I told both of them everything mom told me and how upset she became just talking about it with me…. Her doctor said she would order something for mom that would hopefully start helping her right away. I thanked her and went back to the dining room to sit with my mother. Yes, I surrendered to our Diva Drama cat, Carmen, and aborted the mission to harness train her…! After a good week of working with our little DIVA, several times a day, I finally got the harness and leash on her and actually thought she was going to warm up to the idea of learning how to walk in a harness with a leash… In our last harness training session I lured her into the harness with lots of tuna samples, then attached the leash to the harness, and she rolled around on the floor playing with the leash and was acting like she was enjoying it… See, doesn’t she look like she is having fun? So, while she seemed to be in such a good mood, I decided it might be a good time to take her out on our back patio and introduce her to the great outdoors… NOT A GOOD IDEA…. I got her over to the back door and opened it. Carmen stood there like she had never seen the outside world before even though I open the front door all the time and let her watch the birds through the security screen door. I helped her out the back door and closed it behind us… that’s when our DIVA cat came unglued!!! She sat down on the door matt and howled like I’ve never heard her howl before. She started clawing at the back door and cried and cried trying to get back in. I tried to tell it she was a good girl and she was doing great and everything was going to be alright once she gets used to being outside but she as having none of it! After several attempts of trying to get her to venture off the door matt while she was howling at the top of her lungs, I began to think the neighbors might think our cat was being tortured in our back yard and call animal control or something. There was nothing left for me to do but take her back inside the house and take the harness and leash off of her. Once we were safely inside the house I walked her over to the area carpet(with her growling in a low, evil sounding, growl now) where I was going to get her out of the “torture chamber…” She was none to happy about the whole experience and was letting me know it. Does this look like one angry cat or what? I was afraid to get too close to her for fear she would rip my arms and legs to shreds out of sheer anger and frustration, so I leaned down and tried to unhook the leash from the harness first, but when I did that she stood up on her hind legs, with her front legs up in the air, and started walking backwards shaking her whole body until she freed herself from the whole harness/leash contraption. Yesterday I posted that Bill and I are preparing for a brand new chapter in our lives where we will become full-time RVers! Moving out of our current home and into a 35 -40 foot motorhome will be exciting and new for both Bill and I as we travel the United States and Canada, stopping all along the way to get out and explore the little towns and sights…. 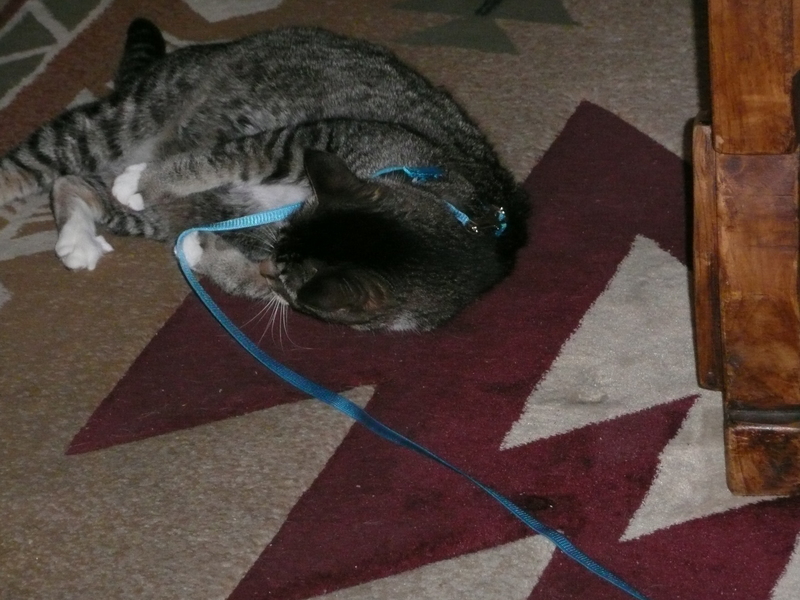 So, the first thing I did was google how to harness/leash train your cat. 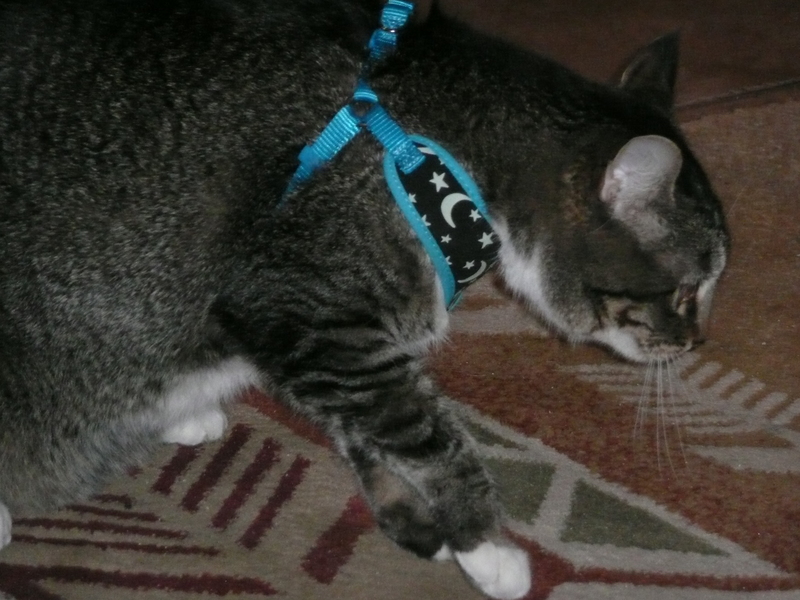 I read through all the steps that said to start out slow and allow your cat to become acquainted with the harness by putting it near the cat’s food bowl and/or sleeping quarters for a few days so they can sniff it, and investigate it, and begin to get use to having it around…. 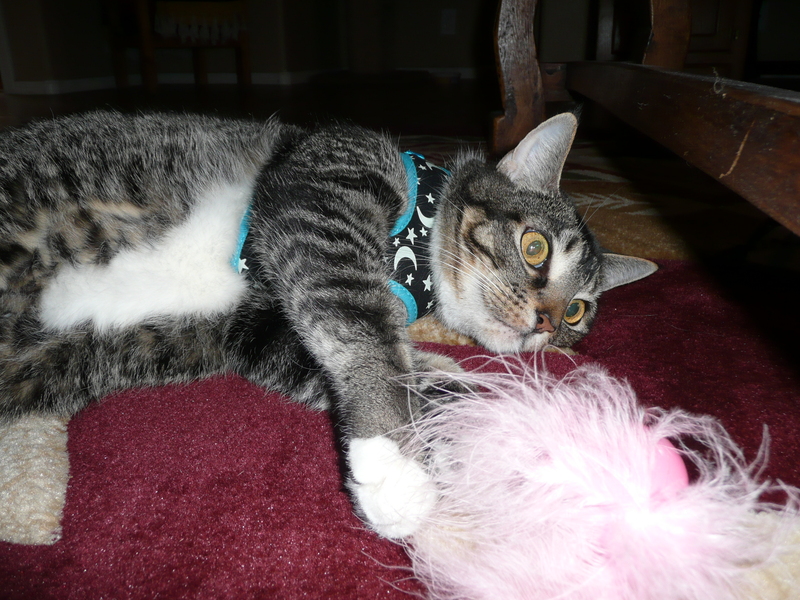 Than I went to the pet store and bought a harness and leash especially for cats. I decided on a pretty soft material that also glows in the dark so I can clearly see her when she is sitting beside me for our outside happy hour excursions… I brought the harness home and introduced it to Carmen letting her sniff it and rub all up against is etc. 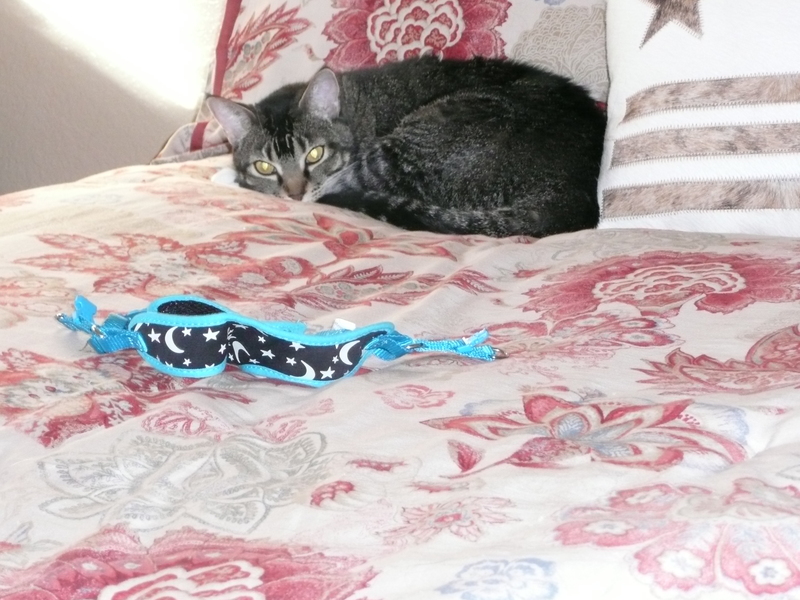 Then I laid the harness on the bed where she naps… see how nicely she is laying there looking at her new harness that I am hoping she is going to love..? OMG!!! when I did that, all hell broke loose… as soon as I grabbed her, she started hissing and growling and became like water in my hands. I had to wrangle her to the ground and hold on tight with one hand while trying to get her legs through the leg holes that were looking smaller and smaller by the minute… I finally managed to get the harness on her and buckled up, but when I let go of her, she stood up and immediately just fell right over on her side with all four legs sticking straight out like she couldn’t move…It was hysterical!!!! I mean that cat looked like on of those goats that pass out and fall over when they get scared. I don’t think I ever laughed so hard in all my life. I just let her lay there for a while like the instructions said so that she would “become use to the harness being on her body…” but she never moved. She just laid there with her legs straight out staring into space..
People who pass through or visit a place without staying for long. 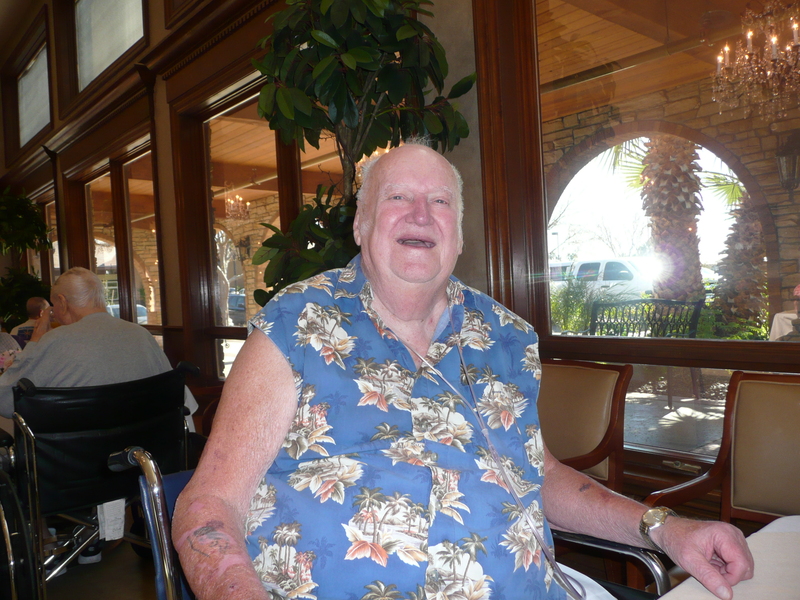 Actually, Bill could retire today, but he continued to work to provide insurance through his company for me. I can’t get Medicare for two more years. However, the desire to get out and start living our dream is so strong…we are looking into Bill finishing out this year working, then purchasing an insurance policy that would cover me for one year, allowing us to sell our home and possessions, buy our new motorhome, and start living our dream as early as 2016! Ever since Bill and I made this decision, we spend hours and hours researching everything we can about motorhomes, i.e. different makes, models, floor plans etc. 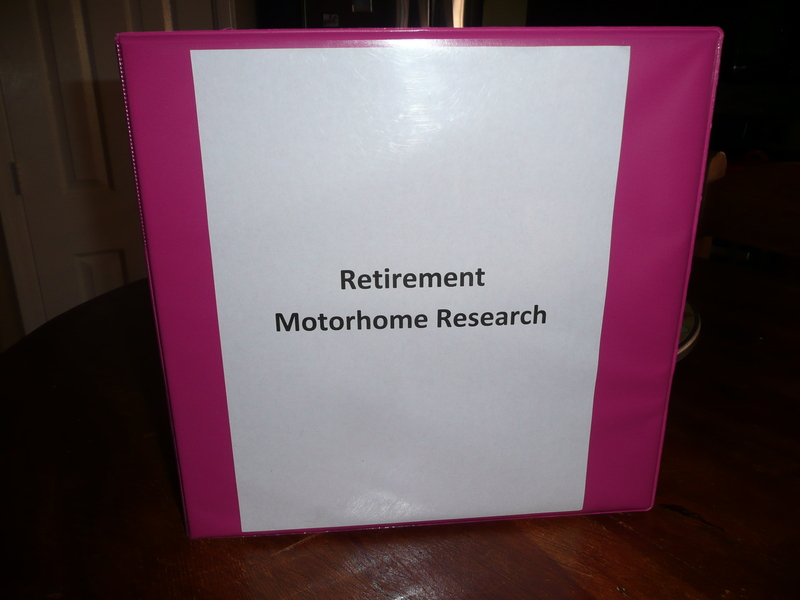 I created a retirement motorhome research binder where I am keeping all the information I find about full-time RVing. I’ve found out all sorts of valuable information about full-time RVing. Like becoming site hosts. Site hosts get their camp space and full hock-ups for free and many also get an hourly wage if you choose to work while you are there… Both full-time and part-time jobs are available that range from working a few hours in a gift shop to giving lighthouse tours when staying in ocean front camp sites… how fun would that be!!! Getting an hourly wage would help offset the cost of gas for traveling and of course free parking and hock-ups can’t be beat!!! We are signed up to attend as many RV shows as we can between now and the time we purchase our motorhome. 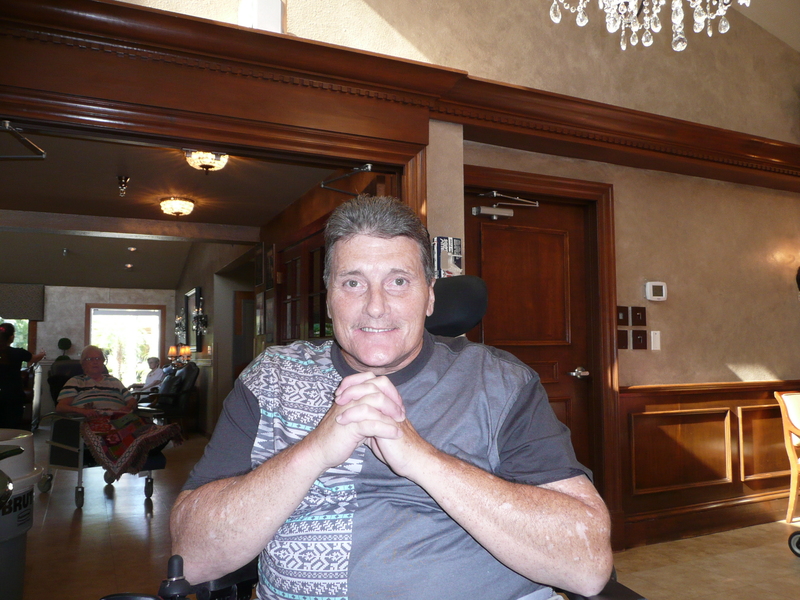 I’m also researching and following several blogs written by other full-time RVers, so that by the time we do purchase our motorhome, we will be well versed and able to make an informed decision about what we want to spend the rest of our lives in… it’s all so rejuvenating and exciting. My mother has been living in a Care Center for six years now. 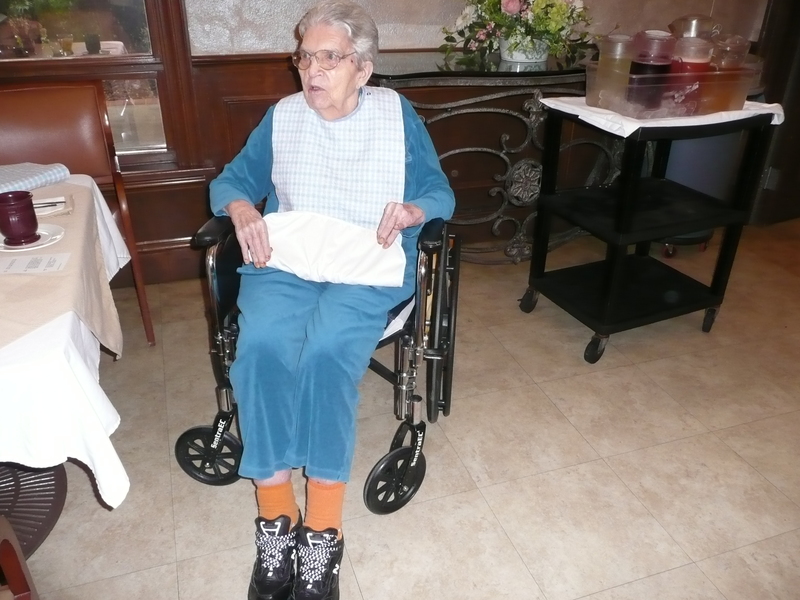 Just prior to moving into the Care Center she bought two pairs of New Balance shoes that cost $98.00 each. Keep in mind that my mother had stopped walking by this time so her shoes will most likely never wear out… However, as my mother’s memory declined, and she was wearing sandals during the summer on a field trip to Walmart, she forgot that she had the New Balance shoes, and decided she need a new, cheep, $10.00 pair of shoes from Walmart. I wrote a blog post about that a while back. A few weeks ago my mother told me that she needed some new jeans. She doesn’t, she has more clothes than she will ever wear for the rest of her life. In fact, she has so many clothes that I keep most of them in a spare closet in my home and bring them to her at the care center, rotating them according to season… But, once my mother makes up her mind that she needs something, she gets very upset with me when I try to reason with her by reminding her of what she already has… This happened again just recently when she started telling me she needed yet another new pair of shoes. She told me her right shoe keeps falling off her foot and she has to find someone to put it back on for her. I told her that the shoe is not the problem, it’s the stretch, corkscrew looking shoe laces she insisted on having because she saw another resident with them and said they would be wonderful because you don’t tie them, they allow you to just slip your shoe on and off your foot. I told my mother that would be great if you didn’t have Parkinson’s, and constantly shake, and wiggle your right leg around causing your shoe to fall off… That didn’t sit well with her and she told me that I just don’t want her to have anything and she was going to call my brother, Danny, and ask him to come and get her and take her shopping for jeans and new shoes… I told her she didn’t need to bother Danny, I would bring her some jeans and look into the shoe situation. After I left my mother that day, I called Danny to give him a heads-up about mom’s shoe and jeans situation and told him if she does get someone to call him, not to promise her he would come and get her because I already have a plan that I think will make her happy. When it was time for me to leave, and I hugged my mother good-bye, she told me that I am a good daughter and I take good care of her… I guess now that “everything old is new again,” all is well that ends well… until next time…. 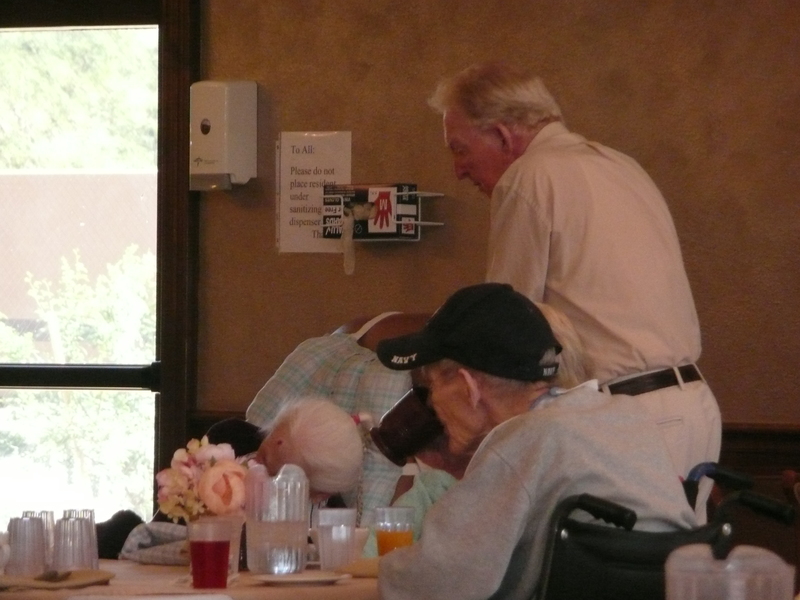 I am sad to report that our dear friend, Bob, who came everyday to visit his sister, Annie, at the Care Center where my mother lives, passed away. Of course my mother has taken the news very hard, and I will spend the day with her again tomorrow to try to help her deal with her emotions…. she just keeps saying she misses him so much, as do I. Bob was one of those amazing individuals that come into your life and leave a BIG footprint on your heart. We all came to love Bob, and his presence among us is very much missed. RIP Bob. You were so loved, and I’m so proud to count you among my friends. I will continue to look in on your sister Annie for you.